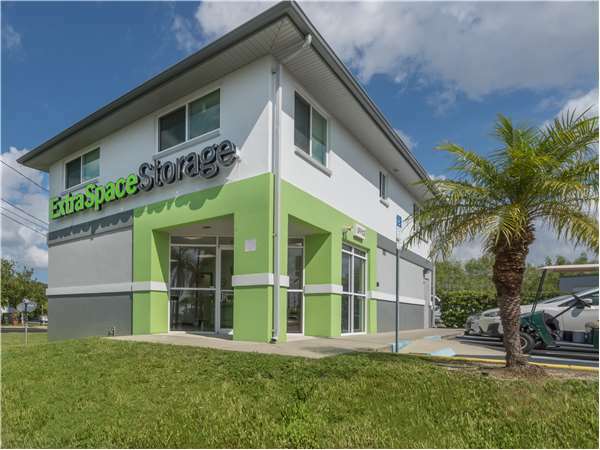 Located near the intersection of Duhme Rd and 150th Ave/Tom Stuart Causeway, Extra Space Storage serves St. Petersburg residents near Madeira Beach, Bay Pines, Seminole, Redington Beach, and Treasure Island. Locals will recognize our facility next to Walgreens across from Madeira Beach Elementary School just up the street from Publix Super Market at Madeira Shopping Center. 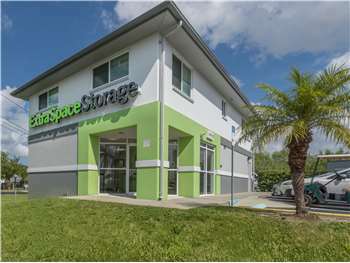 With a wide selection of storage units, climate-controlled storage, and drive-up access, Extra Space Storage on Duhme Rd is the self storage partner you can count on in St. Petersburg near Madeira Beach! Our St. Petersburg storage facility has the space to accommodate both residential and commercial storage needs. We have everything from small 3x3 storage lockers to large 30x30 drive-up units! At Extra Space Storage, we take the safety of our customers and their belongings seriously. That's why we utilize security features like electronic gate access, a resident manager, and 24-hour video surveillance. Worried about storing temperature-sensitive belongings? We have climate-controlled units that maintain temperatures between 55 and 80 degrees year-round to prevent damage caused by extreme heat and humidity. Units with climate control are available in sizes 3x3 to 10x30. Pull a vehicle directly up to your storage unit to unload and load large, heavy items. That's the convenience of drive-up access! This unit feature comes in sizes 10x5 to 30x30. With a well-maintained, secure, clean facility and a friendly, professional team dedicated to providing exceptional service, Extra Space Storage goes above and beyond to deliver an unforgettable self storage experience for customers. Contact us today to reserve a storage unit in St. Petersburg! Great customer service and unbeatable prices. What a great company and faculty at this storage space. Never before have I received such great service at a storage space and I highly recommend you store whatever you need here. Good price, friendly service, great overall. Look no further! This is the place to store your items if you ever need a great place and location. Cheers !! This is the first time using a storage place. It has been a wonderful experience. The prices are reasonable. The different sizes of storage make it possible to accommodate your needs. Recommend it for anyone who needs temporary storage. I've need a space several times in the past 13 years on and off when ever I needed space they have always worked with me getting the right size. It's also clean and kept up really nice with no trash around. When we used ESS before we had no problem. We used this for a year and never had a worry. With this said we came back here. Excellent customer service from the site manager. Clean facility and great location. Very easy to get info and sign up. Highly recommended. Great extra clean and convenient location for Sea Towers move. The location is clean and very secure. Yvonne was the manager of the facility I used in Madeira Beach FL. She was really easy to work with. I used multiple storage spaces at that location over the years and Yvonne was by far the best facility manager! She is friendly, always smiling and willing to help her customers! Very clean storage facility and very helpful staff. Very reasonable price. Great location and very secure area. Store manager was extraordinary! So helpful, met my needs, just great customer service! Used this company for the first time...as a Realtor, I would absolutely recommend to my clients and friends. Great location, helpful and friendly staff, we'll maintained and clean facility. Yvonne was extremely helpful, went above and beyond. She is a great example of what customer service means! Great storage facility, clean and safe and friendly employees! If you want cleanliness and security than Space storage is the place for you. They truly care and the manager is a jewel. Theya re always maintaining the floors and the property is easily accessible and well lite at night. Because you this is the best storage anywhere around and beats all the other storage facilities by a long shot! This is a great storage facility. I have used several others and this facility is the most convenient, friendliest and clean. Highly recommend! This facility was perfect for our needs. Great location and easy access. The manager was very helpful. I am pleased with my experience. Yvonne was very helpful, prompt and professional. location is very clean and secure. Top notch storage units! everyone who works here is very accommodating and work quickly to get you the best storage unit for your dollar. My husband and I put our house on the market and would have never thought it would sell in 23 days. Extra space storage and their staff made a really stressful situation manageable and were able to provide a large enough unit we needed right away. The search for a new house was not easy and we ended up getting a house that needed a great deal of work. The timing of subcontractors wasn't going as planned due to the holidays and the staff were accommodating as we changed move out dates on multiple occasions. The storage units are clean and the site is safe and secure. I would do business with this team anytime. Thank you for your flexibility and professionalism. This facility is very secure and very clean, and there is easy access to all the storage units. The on-premises staff are always friendly and helpful. The people running this facility are the reason I stay. Very nice and helpful. They know their business and run a clean facility. I have ever had a problem and don't expect to. Thank you. My experience with extra space storage has been excellent. THIS FACILITY IS CONVIENIENT TO THE BEACH AND STAFFED WITH FRIENDLY AND CURTIOUS STAFF. IT HAS GREAT SECURITY AND IS EASY TO ACCESS. THE PRICING IS A LITTLE BIT HIGH BUT LOCATION MAKES IT WORTH IT!! The managers were so excellent.. Make you feel like part of a family. Spotless facility. Excellent security. Selecting a storage facility can be somewhat of a daunting experience, but not at this site. We were greeted by Pam who took us through the process cheerfully and with expertise. She patiently showed us two units so that we could decide which would suit our needs. Upon making that decision she graciously made suggestions on how to fill and stack our unit efficiently. All that was left to do was the "paperwork" which was extremely easy because it was all computerized. Pam was even able to work her magic to get a better rate than what we had expected! What a great experience. Very well maintained facility with easy access and courteous, knowlegable staff. I would highly recommend. WE WENT IN TODAY MAY 3RD 2012 TO RENT A UNIT. PRICING AND UNIT GREAT FOR THE DOLLARS. ALSO AIR COND. PAM THE CUSTOMER SERVICE REP WAS PROFESSIONAL AND A TRUE PLEASURE TO DO BUSINESS WITH. HIGHLY RECOMMEND ANYONE LOOKING FOR A STORAGE UNIT TO GO IN AND VISIT WITH HER. I have been there for about 2 months and no problems or issues. The facility was conveniently located and the size we needed was available. We did not choose a Temp Controlled unit, although there were 2 available. The rate was competitive, and unit was clean and facility was electronic access with limited hours. Our sales agent greeted us warmly and answered all our questions. I would definitely choose this "chain" of storage units again for any future needs. I was very impressed as to all the thought that went in to set up the facility including check-in, entry, and security. I really like that when your car goes in you enter your code and the system checks that the car has left (that way no cars can go in behind other cars). I also like the locks offered and the way the locks are checked to confirm that they are correct locks by the customer. I changed my original storage facility to Extra Space Storage a few years ago and I am so happy I made the change. Extra Space Storage is so very clean, which is the big reason I am so pleased. Most storage areas, in my past history have not seemed to care about cleanliness. Great facility close to home.and run by people who aim to please. Had two AC controlled units for over a year and was very happy with the overall experience at this facility. Cement floors need painting. Is getting a bit smelly. Needs better upkeep, I do pay over $1000/year for a tiny cubicle. But service is great, taking care of mail/packages. when my unit had a ceilinng leak you were able to give my a unit to use while the leak was being repaired, I was happy about that. We were looking for a storage facility and Extra Space was nearby. Our first impression is what convinced us to rent with Extra Space. The sales agent met us warmly, answered all questions, and was more than willing to show us various storage units that might suit our needs. She even followed-up later in case we had other questions. She and the state of the facilty is why we rented with Extra Space. We are located at 4319 Duhme Road next door to Wells Fargo Bank across from Walgreens and Publix at the intersections of Tom Stuart Causeway and Duhme Road. Heading south on Alt 19 - use the right lane to merge RIGHT on Park Blvd., stay on Park, passing your 1st Home Depot on the left, you will eventually get to the 2nd Home Depot also on the left, then you will cross Seminole Blvd - passing several food chains on the north and south side of Seminole Blvd, use the left lane to make a LEFT turn as you will be passing the Seminole Mall on the right, make a LEFT on 113th, 113th will turn into Duhme Rd., you will pass the Fire Station on the left, Angry Pepper on the right, Extra Space Storage is on the LEFT across from Publix, on the same side as Walgreens and Chase Bank. Heading north on Tyrone Blvd.- Tyrone Mall is on the left Barnes and Noble on the right, pass Tires Plus, Cobb Theatre, Carrabba's Italian Grill and Square 1 Burger, still traveling north, cross Park Street North, at this point the street is Alt 19 then it turns into Bay Pines Blvd., pass the War Veterans Memorial Park and then the VA on the left, Texas Roadhouse is on the right, bare left towards the Madeira Beach sign, continue over ramp to 1st stoplight. Turn RIGHT on Duhme Rd., Wal-Greens is on the corner, Chase Bank and then Extra Space Storage, 3rd building on the RIGHT across from Publix and Walgreens. Traveling North on Gulf Blvd/Pinellas Beaches - Turn RIGHT on The Tom Stuart Causeway, 7-Eleven is on the corner, Brown Boxer is on the left, heading EAST on Tom Stuart Causeway, cross the bridge, McDonalds is on the left side, get in the first left lane, make a LEFT turn at 150th Avenue at the light, double turning lanes, you should be in the far right lane to make a right turn, Wal-Greens, Chase Bank and then Extra Space Storage is on the right. Traveling South on Gulf Blvd/Pinellas Beaches- Turn LEFT on Park Blvd North (694), cross the bridge, pass The UPS Store on the left, First Bank and Joto's Pizza on the right, keep traveling EAST on Park Blvd in the right lane to 113th Street, make a RIGHT, passing Bay Pines Lutheran School on the corner, passing the Fire Department on the left and Pinellas Trail (overhead), the Mobile gas station is on the right, get in the far left lane, come to the light, Angry Pepper is on the right and Extra Space Storage is on the left at the stop light.